Sorry, this item is not currently available for purchase online. Please see our recommended alternative product. Tackle your to-do list on the go with the budget-friendly Inspiron™ 14 — a 35.56 cm (14") laptop with 3rd Gen Intel® Core™ processors and a thin design. Everyday functionality in a lightweight, flexible device that can travel with you anywhere and provides a visual wow. Budget-conscious users looking for reliability, essential features and strong-performing processors from a brand they trust. Anyone looking for a portable, stylish laptop that meets their daily needs. Starting at about 2.54 cm (1") thin, the Inspiron™ 14 is sleek and portable. And its modern design makes it as stylish as it is mobile. Never be without your digital entertainment. The Inspiron 14 is equipped with an onboard DVD-RW drive and a spacious hard drive to store your music, movies and pictures. Complete your to-do list faster and more efficiently with up to 3rd Generation Intel® processors and Windows 8. The Inspiron™ 14 features an 8-in-1 memory card reader, USB 3.0 and HDMI™ 1.4 ports. Your Inspiron laptop is just the start. Look for these great additions when finalizing your purchase. Your Inspiron laptop comes preloaded with videoconference and McAfee® SecurityCenter AntiVirus software to help you stay connected and protected. We’re here and ready to help. 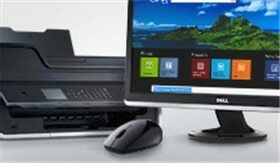 Dell offers powerful protection options.